The NBA is ready for another action packed weekend. LetsRUMBL is ready for another slate of games, and daily fantasy sports players can get an upper-hand with these picks for the weekend. Who makes our NBA picks list this week? Keep reading to find out. The Milwaukee Bucks are on a four game winning streak, and Giannis Antetokounmpo is one of the main reasons for the team’s great play. Antetokounmpo leads the team in scoring with 28.5 points per game. He also cleans up the glass, and averages 10.3 boards a night. After missing two games with an injury in January, Antetokounmpo has returned on fire. In his first game back, Antetokounmpo dropped 41 points on the Brooklyn Nets. Two days later he scored 27 against the Chicago Bulls and 31 points versus the Philadelphia 76ers a day later. Antetokounmpo should keep rolling against a New York Knicks team that allows 105.9 ppg. Fun fact, Antetokounmpo leads the NBA in free throw attempts. Those points add up and could make a big impact in letsRUMBL on Friday. 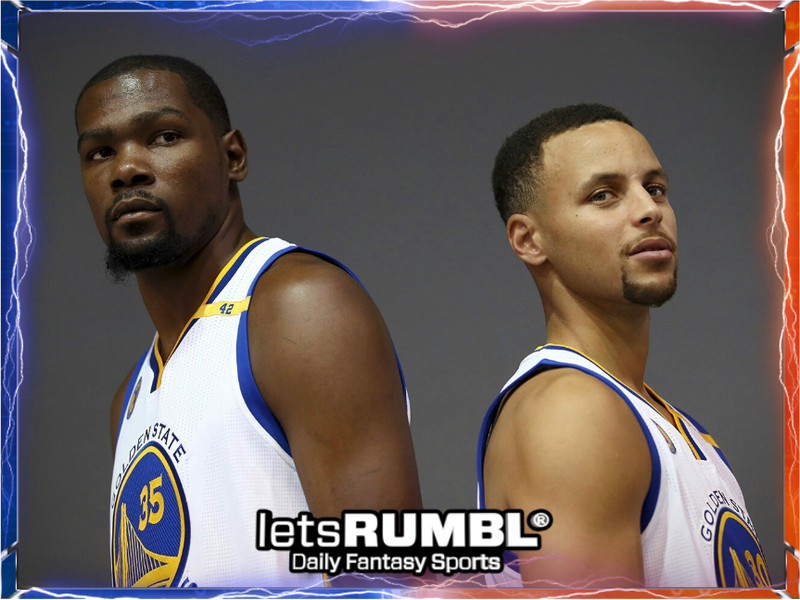 Golden State Warriors teammates Steph Curry and Kevin Durant get the letsRUMBL nod for Saturday night. The Warriors are once again the best team in the NBA, and Curry and Durant are arguably the Association’s two best players. Curry is Golden State’s leading scorer (27.7 ppg), while Durante is just behind him (25.6). The one-two combination of Curry and Durant continues to make NBA defenses have sleepless nights. Both can score from the perimeter or drive to the basket. Think you’ve got them stopped? They’ll just pass to the wing for a wide-open three or dish to a big man down low. The Warriors are unstoppable with Curry and Durant in the lineup, and so are daily fantasy sports players. Curry leads the NBA in true shooting percentage (.675). Although he scored just 14 points against the Utah Jazz on January 30th, it was three nights after dropping 49 points on the Boston Celtics. Yeah, those Eastern Conference leading Boston Celtics. Durant has averaged 24.7 ppg over his last 10 games. He is also playing over 29 minutes a night. Durant missed the last meeting between Golden State and the Denver Nuggets on January 8th. Of course, it was a Golden State win, and Curry laid down 32 points. Despite some obvious cracks showing in the Boston Celtics as a team, the green machine is still atop the Eastern Conference. Kyrie Irving continues to show just why Danny Ainge traded for him, and how important he was for the Cleveland Cavaliers. Irving’s 2017-18 play has shown he is a star, but he still has a long way to go to be a top 5 NBA player. Irving is head and shoulders above his teammates in scoring. The former Duke Blue Devil averages 24.9 ppg. His average is over 10 ppg more than Boston’s second leading scorer Jaylen Brown. The Celtics lack a secondary scorer without Gordon Hayward and the load rests on Irving’s shoulders for now. After missing Boston’s game against Philadelphia on January 18th, Irving dropped 40, 33, 20, 37 and 27 in respective games. His time on the hardwood has been extensive, but it means more points opportunities for daily fantasy sports players. Against Orlando on January 21st, Irving put in a 40 minute shift. The Celtics over reliance on Irving will come back to haunt them. As the season goes on, daily fantasy sports players may think twice about drafting Irving due to fatigue, but right now, he is an all-star selection. The good news for Boston is despite the amount of time Irving has been on the court, he is not in the top 20 of players with most minutes played. In addition, the Celtics guard has been extremely reliable as he has only missed two games this season. The whole of Beantown is counting on him, and your letsRUMBL squad could too.